What is “Class of Admission” on Form I-90? A reader asked a question about Class of Admission while filling out Form I-90, Application to Replace Permanent Resident Card. I did a little Googling and apparently many people are confused by the term USCIS used, especially if they entered the U.S. on a nonimmigrant visa which also belongs to a certain class of admission. For I-90, question 12 is asking for the class of admission with regard to your permanent residency. It is a three-letter code representing the immigrant category under which you became a permanent resident. If you have a newer version, you can find the code on the front side of your green card right under “Category.” It usually starts with a letter, then either a letter or number, and ends with a number. For example, RE8 would be the class of admission for the green card holder shown in the image below. 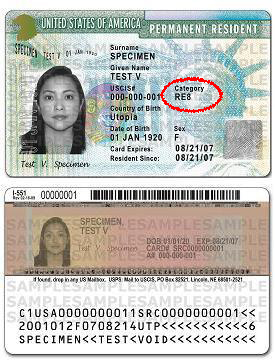 If you have an older green card, the category code may be under or next to Class or some other names. Its location on the card has also changed over time. If you lost your green card and can’t find a copy, I guess you can put down “unknown” for class of admission. Hopefully USCIS will be able to process your request with other information you provided. Don’t write H-1B, EB2 or stuff like that. 12. Class of Admission – List the three letter code for the immigrant category under which you were granted permanent resident or conditional permanent resident status. This code can be found on your card, and it is typically one or two letters followed by a number. ← Is It Easier to Get B Visa in China Now? Thank you very much. Excellent explanation! Where is the code on the older cards? I have one that was issued in 1968. There are two numbers at the bottom left on the front of the card. I was wondering if that was it. Honestly, I have never seen a green card issued in 1968! Is any of the two numbers next to the word “Class” by any chance? That should be it. If you just can’t figure it out, I personally don’t think it would a big deal since you are going to attach a copy of your GC anyway. I had no Idea what it meant. Thank you very much. Very helpful. Very helpful.Thank you very much. Thank youi for the explanation and the link to the classes – this was very helpful! Thank you very much.It;s Very helpful 🙂 Excellent explanation! Thanks to both of you. I really appraciated. Thanks, this helped out a lot. Keep up the great work! Just want to say thanks for making it easy for us. Thank you for help us weave thru the maze of immigration forms! Great I wrote the wrong thing now what? I have a green card that expired 08-2012 and I cant find the number of CLASS OF ADMISSION. Can you tell me please where I can find these number or code. My green card is totally diferent than the one in the picture you showing in this ebsite. Thank you. what is the admission date or where do I find it on a green card? Not sure what you meant by admission date, but there is a “Resident Since” date on the green card. I want to thank this blog for providing the info I was looking for. “Categoy Type”. that corresponds to that in the drop down choices!! I am filling an online application for i-90 under class of admission there isn’t an option for IR6 which is what my card shows. It doesn’t give me an option to type it either and I can’t leave it blank as it is a required field. What to do? I have the Form I-90 (PDF) in front of me right now and can see an “IR5 – Parent of USC” as well as an “IR6 – Spouse of USC” in the dropdown menu. Are they missing in the online application? You can contact USCIS customer service and ask for directions if that is the case. I have got the same problem. I cannot find my class of admission code on my green card in the dropdown menu. I am filling an online application for i-90 under class of admission there isn’t an option for f33 which is what my card shows. It doesn’t give me an option to type it either and I can’t leave it blank as it is a required field. What to do? I’m filling out the e-filing I-90 form to renew my Permanent Resident card(green card) which is going to expire. My code is IR6 (married to a US citizen and I’m from Canada) but the code IR6 is not in the drop down menu. Has anyone encountered this? The hard copy form allows you to write/type in any Category (so I would have indicated IR6) but when e-filing none of the IR codes are in the drop down menu. It is a required field so needs to be selected. I spoke with USCIS today after being on hold for 30 minutes. (used to be 2 hrs in 90’s so I guess things have improved!) I was informed that they are aware of the problem and that they are working on it. She did not give me a time frame by which problem would be corrected. I was instructed to complete the hard copy of the form and mail it in. Same here – online application is missing my class of admission IR1 and doesn’t let me enter manually – what to do?????? Thank you @teach for the information. I also called USCIS and was transferred to their technical support for online forms. However, I was told the estimated wait time was over 700 minutes, so I had to leave a call back number. We’ll see what USCIS has to say, likely to confirm what they’ve already told you. I have a “white” permanent resident card which is up for renewal. In searching for the “Class of Admission” info on the front of the card for the renewal application, I find the letter “X” under the word “Category”. Is “X” the “Class of Admission”? Only the letter X? It is not in the current list of classes but if that is the only one you can find, I would just put it there if I were you. USCIS should be able to determine the correct class of admission from your mom’s current green card. My mom has a category TW1 not in the drop down what should we put? If you’re filing I-90 online the COA field doesn’t seem to be mandatory, so if TW1 is not in the drop-down list I guess you can leave it blank. It’s better than selecting an incorrect category. If you’re filing the paper form obviously you can just write down TW1 for COA. I have a green card, which is white that was issued August 12, 1996. Some of the information is covered with an emblem so I cannot see class of admission. For the white green card the class of admission should be next to your Birthdate, under Category. My father immigrated from Mexico in 1955, his Green Card lists Class as O – 1, what did it mean then? I am looking for the updated category code which used to be SA1.